Recorded at The Apollo, Glasgow, Scotland on June 10-11, 1980 and at The Forum, Montreal on March 27, 1981. Remastered CD released on June 3, 1997. 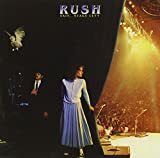 Rush's second live album is a brilliantly chosen selection of tracks from the Permanent Waves and Moving Pictures tour, capturing the band at the climax of their progressive metal phase. Naturally, the focus is on material from the four studio albums released since their last live release, All the World's a Stage, though there are well-chosen selections from 2112 and Fly By Night rounding off the set list. Displaying the band's technical virtuosity, I was particularly taken with the version of La Villa Strangiato - it completely blows me away that they were able to pull it off on stage! - but also quite like the version of Hemisphere's The Trees on here, which is given a somewhat more sombre interpretation which is less grating than the overly twee fairy tale rendition of the studio version. Rush out and buy it! Time for a Rush live album after a swag of studio releases as was customary for the band. 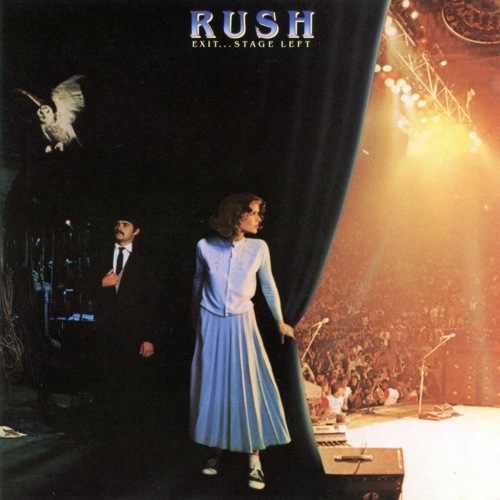 It begins with the familiar roar and then Rush launch in to the lead riff that everyone knows of Spirit of Radio and we are on our way with yet another live Rush album. This one did not thrill me as much as "All the World's a Stage" but the power trio of Lee, Lifeson and Peart is still dynamic and brimming over with heavy crunching instrumental breaks and powerhouse vocals. Red Barchetta and YYZ are familiar territory and as accomplished as ever; I always love hearing live versions of these especially the instrumentals. Rush were careful to include songs that had not been recorded live before for release and so we get unusual choices such as Beneath, Between and Behind, Jacobs Ladder and a drum solo known as Broon's Bane that segues instantly into stalwart favourite The Trees. The 12 minute version of Xanadu is a knockout and a showstopper certainly, perhaps the best live version of this classic. The crowd can be heard singing this lovingly and there is a fabulous lead break on this complex riffing progalicious track. Three perennial favourites follow in Freewill, Tom Sawyer and the brilliant workout La Villa Strangiato. The set list on this album is terrific featuring quintessential Rush and some nice surprises. I recommend this to any Rush fan without hesitation. The concert exists in DVD form and this is the best way to experience this concert but the audio is fabulous so enjoy this live gem. This is one of the few live albums that is worthy of five stars. Not to say that it's completely replacable for the recorded material (which should be purchased as well) but as far as live albums go, this is one of the best I've ever listened to. 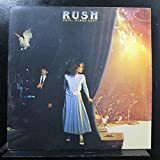 This album also has Rush's greatest performance on any release to date, which is their live rendition of 'La Villa Strangiato' which closes off the concert. There's a vivance about the live performance that was lacking in the recorded 'Hemispheres' version, but comes full force when played in front of an audience. In particular, the Lifeson solo is one of the greatest guitar solos I've ever heard. Having a live audience really seems to make Rush pull out all the stops in their craft. 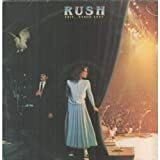 Having been fortunate enough to see Rush live in person, I can testify that this live album captures the magic of what it's really like to go see the band on stage. A great release, and one of the best live albums out there. No RUSH EXIT... STAGE LEFT reviews posted by members yet.